A Supernova is a stellar explosion. It ejects most of the star's matter into space, sometimes leaving behind a small, fast spinning ultra-dense core (about 10 km radius) which later on emits radio beams like a lighthouse beacon (i.e. a pulsar). The above photograph is an example -- that of the Crab Supernova which exploded in AD 1054 and is in the constellation of Taurus. This contains a pulsar. Heavy elements like Iron are manufactured by Supernovae. The ejecta from Supernovae enrich the primordial gas from which the Solar Systems are made. We are therefore made partly from Supernova debris. A supernova fades within weeks. Unless it is relatively close by or a large telescope is used, it is difficult to see the faded object. A close by supernova is a rare event. One such explosion was the Supernova SN1987A, the brightest one in twentieth century, which occurred in the Large Megallanic Cloud -- a galactic satellite of our own galaxy -- visible only from the southern hemisphere. In the left picture, the star that later exploded was clearly identified from previous photographs. Neutrinos from this SN -- the first extra-solar neutrinos detected -- confirmed long standing ideas about how stars evolve in their late life. The Supernova is the bright star near the centre with a cross in a larger view of the Large Magellanic Cloud. One of the brightest supernova of the century in the northern hemisphere, Supernova 1993J in galaxy M81 was an extra-galactic event, though still sufficiently close to be observed for a long period of time. The above are photographs of the parent galaxy M81 before and after the explosion. In the left picture (before SN), the star that exploded is too faint to be seen here whereas it clearly shows up as the circular bright spot in the picture on the right. In the above photograph with longer exposure, taken before the Supernova exploded, the arrow marks the faintly visible star that eventually exploded. A "finding chart" by which the position and the brightness of the Supernova is measured accurately to a few ``calibration stars" and a larger scale view of the parent galaxy M81 is also diplayed below. More on the First Supernova of the "Internet era"
SN1993J was the first significantly bright supernova of the 'Internet' era. Computer to computer communications allowed ready access to observational data on the supernova to astrophysicists all over the world. Using this data, several groups around the world computed the evolution of Temperature, Bolometric Luminosity, and the Photospheric Radius of the Supernova with time. Light curves etc. like these and the supernova spectrum can reveal the nature of the progenitor star and of the physical processes occurring in stellar interiors before, during and after the explosion. For SN1993J, such analysis suggests that while the mass of ejected nickel (approx. 0.05 Solar mass) was normal for this type of SNe, the mass of the Hydrogen envelope of the Supernova progenitor (about 0.15 Solar mass) was unusually low. The small mass of the Hydrogen envelope suggests that the progenitor was originally a part of a binary system, and lost most of its hydrogen envelope to it's companion star during the red Supergiant stage. A study of evolution of binary stars (see panel below) helped in estimating the separation of the exploding star from the binary companion to be approximately ten times the distance from the earth to our sun. 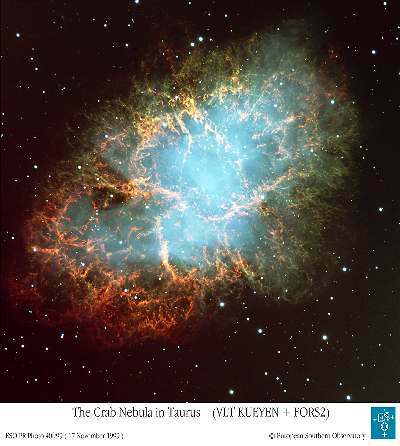 The Crab Nebula seen through the Very Large Telescope (Kueyen) FORS2 instrument at Paranal, Chile; European Southern Observatory. SN 1987A, before and after: D. Malin and AAT Board. SN 1987A and Tarantula nebula : C. Madsen, H.E. Schuster and O. Pizarro, ESO Annual Rept 1987. SN 1993J Before and After : E. Telles, D.Jones and J. Lewis in Gemini 1993. Close up of the field of SN 1993J before explosion: in Gemini 1993. Finding Chart 1993J and galaxy M81 : L. Wells, KPNO. Light Curves etc 1993J : A. Ray, K.P. Singh, F.K. Sutaria JAA(1993) -- data credits referred to in the JAA article and IAU Colloq 145. Binary Evolution: N. Rathnasree and A. Ray (JAA 1992).